My wife, Vicky, and I had been married for ten years and had three children, Sara, Daniel and Jonathan, and now Vicky was pregnant again - with number four. She had a number of miscarriages previously and ten weeks in with this pregnancy it again looked like she had lost the baby. We went to the hospital for an ultra-sound scan, fully expecting the sad confirmation that the pregnancy was over. However the scan revealed a very alive little baby doing back flips and also evidence that possibly a twin had been lost, or some abnormality on the other side of the uterus. Everything seemed to calm down from that point on and she was told to just continue and treat it as a normal pregnancy. As she had been given the all-clear, and having had three children before, she was not in a great hurry to get in touch with her midwife, eventually contacting her at approximately the 26 weeks point. However, prior to this, at about 20 weeks, Vicky had mentioned to me that she was losing some fluid, but we were busy finishing and selling one house and moving into another, so being as she felt well, we didn’t give it much more thought. Once the midwife was involved however, she was very concerned about this and explained to us the seriousness of the situation. The bag holding the amniotic fluid obviously had a hole in it which could lead to a number of different complications. 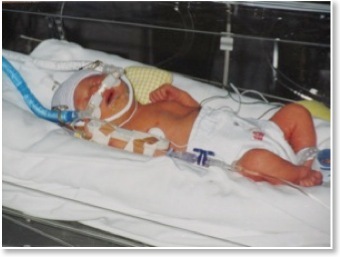 Firstly, they were worried about the risk of infection affecting the baby, then the fact that without sufficient fluid the baby wouldn’t be able to do the practice breathing necessary to develop its little lungs. Thirdly, as it grew in the womb, the cramped space would put pressure on the baby’s limbs rather than on the sealed bag of fluid, resulting in bent leg bones at birth. None of this was what we wanted to hear but this baby was already a miracle to us so we just prayed and committed it all to the Lord. The specialists said that the baby would probably be born about four weeks early at 36 weeks gestation and they wanted to admit Vicky into a hospital in Wellington right away at the 26 week point for total bed-rest until the baby was born - which was expected to be in about 10 weeks! Wellington is at the bottom of the North Island of New Zealand and we live in Nelson which is at the top of the South Island. (Nice place!) Being as this would have been hugely disruptive to the family, we thought it of the Lord when the medical people apologised that this was not going to work as they wanted. The paediatrician, who was going to be overseeing Vicky’s progress in Wellington, was away on extended holidays – so she was able to stay in Nelson. Apart from weekly visits to the hospital everything seemed to go well for the next six weeks. Then, on Boxing Day 2000 at 33 weeks, Vicky went into labour. She was given medication to stop the contractions so that they could fly her to a larger city hospital that had a ventilator for the baby, as its lungs would likely not be properly developed at this time. The closest two hospitals with this equipment were unable to take her, so she was flown for an hour and a half in a small, twin engine plane to Hamilton in the North Island. Vicky said afterwards that she thought she was going to die on the way because the drugs they gave her before going on the plane made her blood pressure drop so low that she was almost too weak to move. Once she arrived at Hamilton things started to drag out. The labour pains never really started again until the next day and even then, were only about an hour apart. This continued for two more days and being unable to lie down, had to try to sleep in a chair. Although Hamilton was far from Nelson, she was now very close to where her parents live, only a 20 minute drive from the hospital. She was able to spend much of the next two days resting, as best she could, albeit in a chair, at their place. Early the next morning, the labour pains started in earnest, more as for a normal birth, and she went back to the hospital. After a pretty complicated delivery, our little baby girl, Julia Hope Murray was born. I was at home in Nelson looking after the other three children, having to work as well as I hadn’t been able to schedule any leave since our baby wasn’t due for another 7 weeks. I said, “Ok...well that’s real sad but the Lord knows. I’m sure that although that’ll change things for us as a family, we’ll still love her and somehow we’ll make it through this.” I told her I would be in touch later. Vicky is pretty strong and didn’t complain about going through the birth and things without me. In fact, she said because it was so complicated, she felt more like a medical misadventure than a mother giving birth, so she was glad I wasn’t there. But now I knew that I needed to be there with her. I work for the local airline and had flying duties scheduled for the week ahead, but I called our flight crew operations and told them of the situation and that I would not be available now for a week. When I got off the phone I said to the kids, “Get whatever clothes you need and throw them in the hallway – just what you need – then get in the van.” I grabbed a suitcase and went down the hallway, scooped up the clothes, did up the zip and we were on our way. It was a sad trip. My heart was heavy but I knew I had to be strong. I explained to the kids all I knew about children with Down’s syndrome and that they are very loving and just respond so delightfully to being loved. I also explained that although it certainly would change some things for us, the Lord knew all about it and somehow this was going to work out for our good. Sara started crying and said, “I really wanted a sister, but I wanted a normal one.” I had to swallow hard on that one. When we finally landed in Hamilton, Vicky’s folks met us and took the kids home with them so I was able to go to the hospital, arriving somewhere around 7pm. Vicky was very surprised to see me. She wanted me to know that she had “behaved herself” when they told her the news about Julia’s condition. She cried but said, “I didn’t say anything dumb or react badly.” I was proud of her! We went together to see Julia. Vicky said when Julia was born she was purple and floppy and her nose was flattened across one side of her face, so I braced myself. She was very little, just four pounds, was in an incubator and had a woolly hat on that enveloped her little head. There were tubes everywhere but surprisingly she hadn’t needed the ventilator! Her little legs were bent quite a bit, but we were prepared for that and they said they would straighten as she grows. Vicky showed me a Polaroid photo of Julia which one of the nurses had taken straight after she was born and she looked very much like she had Down’s syndrome to me. With the hat on, it was kind of hard to tell what she really looked like, just that she was small. While on our way there, someone I spoke to said that Down’s is a problem with the 22nd chromosome. Standing there, looking at this tiny little baby, born 7 weeks early and struggling with every breath just to survive, it struck me that if this chromosome was missing or whatever the problem was, then the same Creator that made her in the womb was still here right now. He could still add a chromosome if that’s what she needed. It didn’t really matter much whether He put that bit in before or after she was born, it’s no trouble to Him either way, and then she’d be completely normal. Sure it would be a miracle but our Lord is in that business, and anyhow, this little baby already was a miracle. Vicky and I prayed again, asking for a miracle. We also asked our friends to pray. There was a convention at Brother Paul Moffitt’s church in Stratford, Taranaki, going on right at this time so all the saints there prayed for us too. The days dragged on while we waited. I’d look up symptoms on the computer and go back and try to disprove that she had them. I looked again at that photo of her – she looked so Down’s and I didn’t like it because I wanted to believe the Lord was making her 100%. I said to Vicky I wanted to destroy that photo because I wanted to imagine her well. She said ok, so I ripped it up and threw it away. On day four, a Christian brother drove a couple of hours to come and see us. I thought it was nice, especially as he had always seemed a little distant from me, especially regarding my stand on the absolute importance of the Prophet’s Message in this day. He asked to talk to me and we went out into the hospital corridor. He said, “The reason this has happened to you is because you are a secret sinner.” That was not exactly the sort of encouragement that I was looking for in this deep valley we were going through! He said I needed to repent and then maybe God would be gracious and heal our baby. I learned a lot from that, but two things stand out: One, you don’t have to get mad when someone who should know better kicks you when you are down. I still might not be fully at the “count it all joy” stage, but I believe it, and by the grace of God I’m heading that way and I didn’t get mad. Two, our persecution often comes from much closer to home than we want to believe it would. I went back in and told Vicky that latest twist in the plot. We were getting tired and that interaction didn’t help. We had hoped we might have heard the results of Julia’s test that day, but couldn’t wait any longer so we went back to Vicky’s folks place for tea. You can imagine how thrilled we were, and we were ever so thankful to the Lord! Again we cried but this time for joy! I thought afterwards how perfect God’s timing is. When the brother was at the hospital trying to accuse me of being a secret sinner, the people from the laboratory had already tried to tell us Julia was okay, but we thought we’d find out first if we waited at the hospital. Some have said Julia might have been alright anyway, and this might be so, but the experts thought otherwise and the photo certainly looked that way. However, if our heavenly Father fitted or fixed the 22nd chromosome before or after she arrived, it’s all the same to me. On the December 30, 2000 He gave us a little miracle girl, called Julia Hope Murray! Now we’re another 10 years on and Julia is a fun-loving, chatterbox 10-year-old that’s as sharp as they come. Most importantly, she has given her heart back to the Lord who gave her life to begin with, and has been baptized in His name. 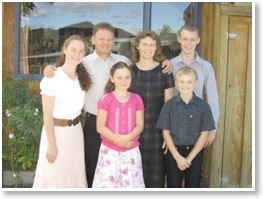 Together with her big sister Sara (almost 19), brothers Daniel (16) and Jonathan (12), and with Vicky and me (45), we’re rejoicing as we’re pressing on in the light of the end time Message, to the coming of the Lord. May God richly bless and keep you all.